In the late 1920’s experiments were being undertaken to test aerodynamics. One result of these test was three prototype Dymaxion 3-wheelers built by the 4D company in the USA. Richard Buckminster Fuller conducted wind-tunnel test on three-wheeled teardrop shapes with a V shaped groove running under the vehicle. A rudder was also added to the vehicles and Fuller intended that this would unfold from the upper side of the tail and provide stability. In 1933 Fuller hired Starling Burgess, an naval architect and a crew of expert sheet metal workers, woodworkers, former coach builders and machinist and they designed and built Dymaxion Car Number One which was shown publicly in July 1933. As a result of enclosing all the chassis and wheels in a streamlined shape Fuller is reported to have driven at 120 mph with a 90 hp engine. A conventional 1933 car would have required, Fuller estimated, at least a 300 hp engine. Fuller also claimed that fuel consumption of the Dymaxion car Number One was 30% less than a conventional car at 30mph and 50% less at 50mph. The two front wheels of the Dymaxion Car One were driven by a Ford V-8 engine. The single wheel at the rear was steerable. On Dymaxion Cars Number Two and Three an angled periscope was provided to help compensate for the lack of a rear window. Initially the car created vast attention where ever it went. However a British auto enthusiast flew to Chicargo to examine the Dymaxion car and when he was injured and his driver killed after the Dymaxion collided with another car the headlines in the press referred to the vehicle as a “freak car” and undermined its 3-wheeled design. 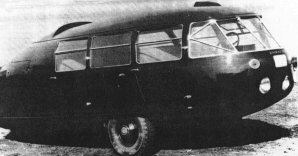 Although an investigation exonerated the Dymaxion car the car received a bad reputation and the British group cancelled their order for Dymaxion Car Two. The Dymaxion Car Three was featured in the finale of Edward Hungerford’s “Wings of a Century” pageant at the 1934 Century of Progress Exposition. The design of the Dymaxion cars was one of the biggest break throughs in automobile design since the car had originated some fifty years earlier. Only one car (Car Two) now remains and is kept at the National Auto Museum, Reno NV.